Many people think of wishlists as being applicable only on special occasions. Children often make wishlists for Santa Claus. Parents may create a wishlist for a baby shower. Brides and grooms-to-be often “register” at particular stores, in effect, creating a wishlist. While these uses of wishlists can be very effective on special occasions, many people don’t realize that wishlist strategies can be an effective e-commerce tool all year long. In e-commerce, shoppers often express an affinity for an item, but for whatever reason, are hesitant to commit to adding it to their cart. This could be due to finances, timing, or a myriad of other factors. That’s where wishlists come in. By allowing customers to save specific items for later consideration, they save time in having to search for the item all over again later. In addition, the list can be shared with friends and family to provide gift ideas for special occasions. One area in which wishlists are particularly helpful is high-demand items. If a company’s supply of a popular item is unable to satiate the demand for the product, it would ordinarily entail a lost conversion. However, if the company offers a wishlist option, the customer can add the out of stock item to the wishlist and receive an email once it’s back in stock. This saves the consumer the trouble of having to search for the product all over again on another site, and helps the site guarantee a conversion. Another useful aspect of wishlist strategy is its use in email remarketing campaigns. Since wishlists make it easy to know what products a customer has interest in, companies can easily target sales to already interested customers. This process works similarly to abandonment remarketing. Wishlists, especially those which are shared, offer a glimpse into the wants and needs of individual customers in a way that shopping carts do not. While carts often include items for others, a shared wishlist is a direct indication of what a customer personally values and desires as gifts. This information can prove extremely useful to e-commerce sites. Wishlists provide a way for customers to save items without feeling as though they need to purchase the product. This provides easy access to the items, while not requiring them to remove them from the cart when they go to purchase other items. Thus, instead of limiting consumer data to what can be immediately afforded, a wishlist allows consumers to express their desires without having to commit to a purchase. Plus, if they opt-in, drip emails can be sent, often with an incentive, to eliminate friction to conversion. 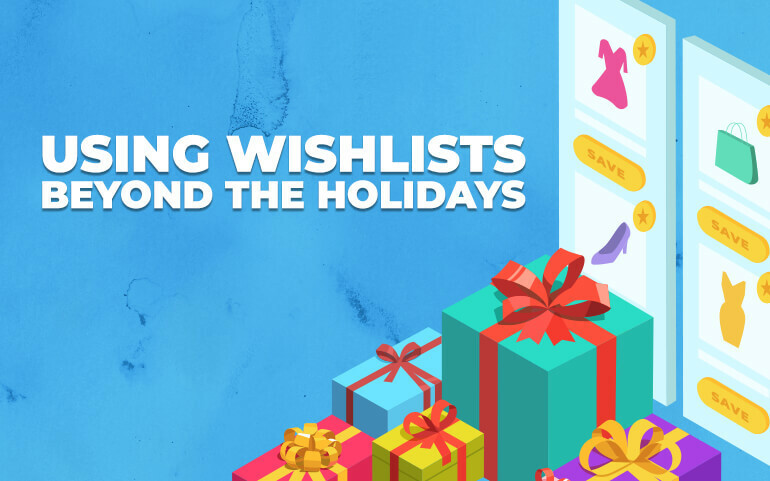 In addition to easing the shopping process for a consumer’s loved ones, wishlists offer remarkably clear insight into the kinds of items a customer wants. This opens the door to numerous remarketing possibilities. Instead of using wishlists to help others shop for them, some people utilize them to aid ease the gift buying process. For instance, imagine a person who is planning to buy gifts for ten people this year. For many on his list, he’s weighing out multiple gifts. If he has no way of saving his considered purchases, he could easily wind up having to search for between 20 and 30 options all over again before making his decision, potentially taking hours. This situation is exacerbated further if he tries to shop on a mobile device. This is where wishlists can be invaluable. Instead of searching all of his gift ideas again, he can simply pull up his “wishlist”, which in this case, is more of a shopping list, and purchase directly from it. This principle works throughout the year for birthday and holiday gift giving. Many consumers use wishlists to track pricing. This means they will likely welcome a remarketing message offering them an incentive to purchase, especially in the case of a discount or price drop. This can often re-engage a customer sufficiently to prompt conversion. In addition, shared wishlists can often bring new users to your site as they shop for someone else. This is especially helpful because it decreases the chance of the user shopping elsewhere for the same gift. Don’t Enter Next Year List-less! Although wishlists are often associated with the holidays, their year-round utility is unquestionable. By providing a low pressure way for shoppers to track products of interest, everyone wins. The consumer can reap the benefits future sales and discounts, while the site can obtain a better understanding of their behavior and interests. Even though the decorations may come down after the holidays, wishlists are in season all year long.